Jan Hedh believes that everyone should have the opportunity to enjoy freshly baked bread for breakfast, lunch, and dinner! More than just a collection of recipes, this guide contains vivid, full-color photographs of step-by-step methods to knead, roll, braid, cut, and bake dough into a variety of shapes and styles. From dinner rolls and pudding to baguettes and waffles, Swedish Breads and Pastries is the ultimate guide to bread making that no chef, event coordinator, or home baker will want to be without. 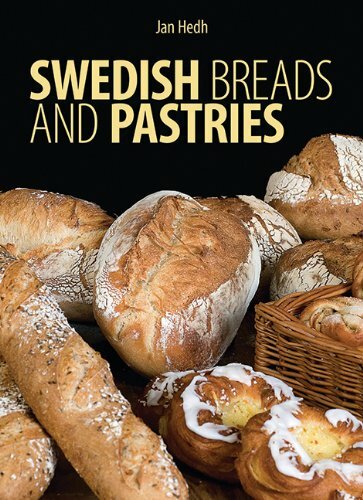 The Scandinavians are known around the world for their delicious breads and pastries—now you can indulge in those same flavors and aromas in your own home. Jan Hedh has spent several years working to develop the art of baking bread in Sweden. He is also a partner in the artisan bakery Peter’s Yard. Jan Hedh has collected recipes for the types of bread he particularly likes, mainly plain breads such as loaves baked with sourdough, baguettes and ciabattas, bagels and pita bread, dinkel bread and chestnut bread, artichoke bread, bilberry bread, lemon bread and rye bread - but also English muffins, French chocolate bread and apple cake from the south of Sweden.